Can we create powerful (and “power-full”) storytelling for advocacy that shifts power to people and communities so they may better control the change they seek? The “traditional” framework for advocacy storytelling is built around persuading those who aren’t directly affected – or who aren’t currently engaged – to empathize and act. This is a good way to go when what you need are people to write Congress, come to a march on Washington or give you money so you can do more of your good work. But persuasion isn’t about power. Persuasion acts on those not affected. Somewhere along the way it’s possible—too easy, really—for the change that needs to happen to be disputed, watered down, stalled in a committee. Meanwhile, real people go hungry, real homes sink into the ocean, real wildlife lose a place to live. Darren Walker, president of the Ford Foundation, recently wrote Why Giving Back Isn’t Enough in the New York Times. In it, Walker calls on the philanthropic community and, perhaps, a broader economic and political establishment, to not simply address the effects of inequality and injustice on society but to solve their root causes. Farhad Ebrahimi of the Chorus Foundation wrote about the Foundation’s decision to focus on systemic change and supporting transitions to a new political economy in choosing how to direct its support of climate change advocacy. It’s not a new idea to social justice advocates: We can (and should) feed the hungry but wouldn’t it be more prudent to tackle systemic causes of inequality and poverty that are leading to a growing number of hungry families and children each year? Pressuring the System or Shifting Power? Advocates and campaigners can do much more to tell the stories of people impacted by inequality, poverty, hunger, war or environmental disaster. And many are doing just that with interviews, personal histories, photos and video, and other narratives that tell stories of the impacted and less powerful in their own voices. Recent work by Humans of New York tells the story of refugees to help fundraise for the community. In the film @Home, activist Mark Horvath interviews dozens of homeless people, family members, and others in the community to tell the story of homelessness from the perspective of those living it. The Munk School of Public Affairs at the University of Toronto is doing something brilliant that NGO leaders should check out. The Fellowship in Global Journalism, an 8-month program that trains subject experts to become reporters. The program gives students the support, training and tools needed to create powerful stories for widely read news and online media outlets. Training focuses traditional and digital reporting skills and the program provides participants with high-level mentorship from working editors. All that is layered on top of the participant’s strong subject expertise. An ocean issue that could use more news stories: deep sea mining. This is an Auxiliary Cutter to be used by Nautilus Minerals for seabed mining near Papau New Guinea. Photo via Nautilus Minerals. Imagine, for example, the stories that a few oceans experts could create for widely read media newspapers and online media if they had deep skills in reporting, data visualization, video production and other storytelling skills needed today. You don’t see many oceans stories because traditional news outlets don’t have staff to cover those stories and new media outlets haven’t built up subject expertise. But all are looking to publish great stories people will read and share. It’s not that readers don’t care about oceans, it’s that there’s nobody to tell the story. And more (and better) stories are needed to support a public narrative on which advocates can hook their calls to action. Oceans are just one example. You could swap out medicine, immigration, childcare or prison reform and get similar results. Great news stories are in higher demand than ever so why not make them about issues that matter. There are more places reporting general news for national and global audiences than ever. Some start with a V: Vice and Vox. A is covered: AlJazeera. And then there B for Buzzfeed and M for Mic. Meanwhile, long-time regional, national and global news outlets are cutting full-time positions but, in most cases, hungry for good stories. 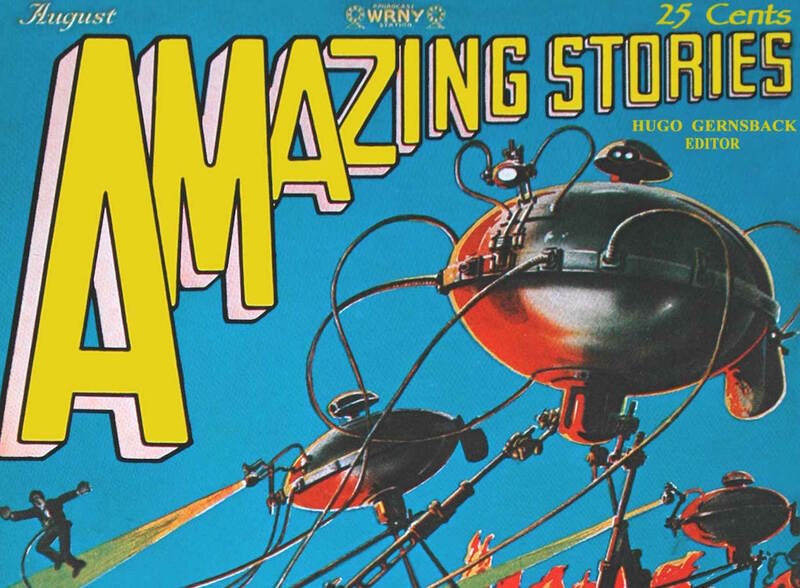 There are too few people who both know their subject and can develop great stories about it. This creates an opportunity for policy experts to engage global media in new and more direct ways. It would be fantastic to see the environmental community or other advocacy sector support a similar endeavor. In the movie Big, Tom Hanks plays 12 year old Josh Baskin who puts a coin in a magic wish machine at the amusement park arcade one summer night and asks to be big. Nothing happens after making the wish so he heads home and goes to bed. You know the story. Josh wakes up the next morning and is, well, BIG (and played by Tom Hanks). Sometimes, your campaigns go big. You probably didn’t plan for it (though you may have wished for it). The ride may be fun but it’s probably not what you expected. Sometimes, things don’t turn out as you hoped. You didn’t raise much money. New people didn’t stick with you. The media didn’t respond as you hoped. The big suit doesn’t always fit right — you may walk away disappointed but a bit wiser. I’ve been thinking a lot about the question “What does it mean for a to ‘go big’ if you’re a nonprofit?” What is a viral campaign? That’s because I’m organizing a session here in Denver with the folks from Tech4Good titled Going Viral: The Ups and Downs of Hitting it Big. The program is tomorrow so you’ve probably missed it. We don’t have to find Zoltar and wish to be big but we do need to know what “big” is, tap into what helps make campaigns go big and be ready when it happens (even if it’s not as dramatic as in the movie or the ice bucket). When it’s really big you know it. The ALS Ice Bucket Challenge was big. Very big. A 12 month Google search trends chart tracking ALS and Obama searches. The ALS spike is reminiscent of the Super Bowl and other huge national events. Taken a trip lately? You’ve likely used sites like TripAdvisor and Yelp to research places to eat, sleep and visit. You’re not alone. Yelp received 138 million unique visitors in the second quarter of 2014. TripAdvisor sites currently receives 280 million visits each month. The sites are highly trafficked by millions in the US and around the world looking for information and/or willingly writing up reviews and sharing photos. Yelp and TripAdvisor (along with similar crowd-driven travel sites) are treasure troves of content that can help those of you working on place-based advocacy and outreach. The sites come up high in search results, provide user-generated content that can accurately describe what people are looking for and doing when visiting a place, and are themselves communities with highly engaged participants. Here are three ways to take advantage of crowdsourced travel sites. Example of place-based search results. 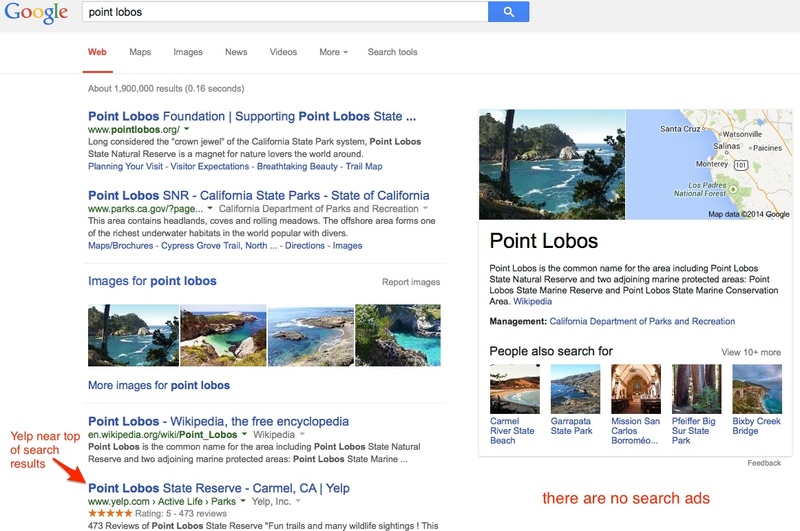 These Google results for Point Lobos show Yelp near the top and no advertising. Crowdsourced travel sites like Yelp and TripAdvisor are content rich, linked to from across the web and optimized to perform well in search. Google a national or state park and you’re likely to see a TripAdvisor or Yelp entry near the top of the results. The Point Lobos (a state natural reserve in California) search results here are an example. This demonstrates the power of the search strategy used by these sites. In many cases, though, it also provides an opportunity to reach very interested audiences: people planning to visit an area. Often, nobody is advertising around online searches for parks and other natural places. The annual Colorado Health Symposium kicked off earlier today. The Symposium has become the main gathering of people in the state and region working on a wide range of health issues (and it’s likely a big event on the national scene). Colorado Health Foundation staff organizing the event do a great job using YouTube, the web, Twitter and Facebook to engage people during the event. The content is great. Follow along on Twitter at #14CHS. The theme of this year’s Colorado Health Symposium is Health Transformed: The Power of Engagement. Today’s discussions about how to engage people in health conversations talked about meeting people where they are, communicating on their terms and how to use language that fits the community you’re trying to reach. That’s a great place to focus attention. Advocates that don’t engage their audience aren’t doing their job. But it got me to thinking about how people are talking about health in Colorado now (and how much they’re talking about it). What ARE people talking about when they talk about health in Colorado? What else are they talking about? What can we learn about the state of public engagement on health by the looking at recent online conversations? The chart below uses Topsy to analyze the use of three sets of keywords on Twitter in the past month: (1) tweets that have the words “health” and “Colorado” in them; (2) tweets that have the words “healthcare” and “Colorado” in them; and (3) tweets that have the words “pot” and “Colorado” in them. The “colorado health” conversation is dwarfed by mentions of pot. Talk of health in the state is dominated by debates over Obamacare. None of these are huge conversations over the past month and, clearly, the conversation about each of the topics represented by these terms is bigger than the numbers in this chart. We’re only looking for these specific words, after all. And we’re only looking at Twitter in the past month. This is just one snapshot, not an extensive analysis. Hop on Topsy to play with these or other terms. But the chart is telling. The biggest “spike” in Colorado health conversation happened on July 20th as the result of a Denver Post story about billing issues with healthcare plans sold on the Colorado exchange. This story has little to do with health but is instead tied to the continual political debate over Obamacare/the Affordable Care Act. It’s probably no surprise to anyone that politically charged conversations about health insurance laws displace actual health conversation. Online channels certainly aren’t the only (and maybe not the best) place to engage people on health issues. Many people in key audiences may not be online, or at least not on Twitter, though I’m guessing many are on Facebook and other networks. The health conversation, like many others, needs many points of contact. Real human health stories need more (and stronger) online voices to compete with the healthcare policy debate. Access to healthcare services is a huge part of good health but politicizing it is polarizing the discussion and making it hard to have real conversations about other aspects of good health (nutrition, food choices/prices/access, school lunches, active children and more). More analysis of the health conversation wouldn’t hurt. How are real people talking about health (and healthcare) in Colorado? And the nation? There’s a wealth of data out there on the social networks waiting to be scooped up. And what about the pot conversation in Colorado? Well, people use the word “pot” in connection with Colorado much more often than they do health or healthcare. Welcome to Colorado! We threw pot into this chart mostly for comparison’s sake. Seems that health and healthcare should be bigger conversations than pot. Something to aspire to (and maybe learn from) going forward. As advocates, if we want to engage people online we need to know what they’re talking about and how they’re talking about it. Otherwise, we may be talking to ourselves.